TPC Overall Rank: #33 out of 2933 rides. In User Top 10: 15 times. User Tracker Count: 63 times. One of the best flumes I've been on. Two intense drops that give more &quot;stomach drop&quot; feeling than most roller coasters do. The way it winds around the boardwalk is quite unique and scenic, and the underground section is quite different. Overall definitely ride if you're at Wildwood, and even though it's getting to be quite expensive, it's worth the money to me. One of the biggest highlights of my trip to wildwood! I loved the part under the boardwalk! The 2 drops made my stomach hurl, unlike mega coasters like El Toro. The best ride at Morey's Piers. You cannot miss it! My god. I think I have found a ride better than the flume at Knoebels. This was great. At night, this is a scenic ride through what seems like the whole pier. Then the drops come and soak you. Just loved it loved it loved it. Definitly my favorite log flume of all time. Riding it at night is even better. You get a great view of the pier, and a relaxing ride until it drops you down the hills. The underground part is the best! I remember some years they would have echos and scary sounds playing, with fake caves and colored lights. As a little kid I was afraid the ride was going to take you over to Dantes Inferno (located directly across from the Zoom Flume). Slimey black seats, wet butts, and water in the boat is the best. This has to be the best log flume Ive ever ridden. The whole concept of building the track above the boardwalk was genius.I find when I ride this one at night it feels like you might washed over the edgeon some of the turns. Truly an exciting ride. I like this log flume, it is steep, fast, and has a cool section that is under the boardwalk. Ok log flume i guess. 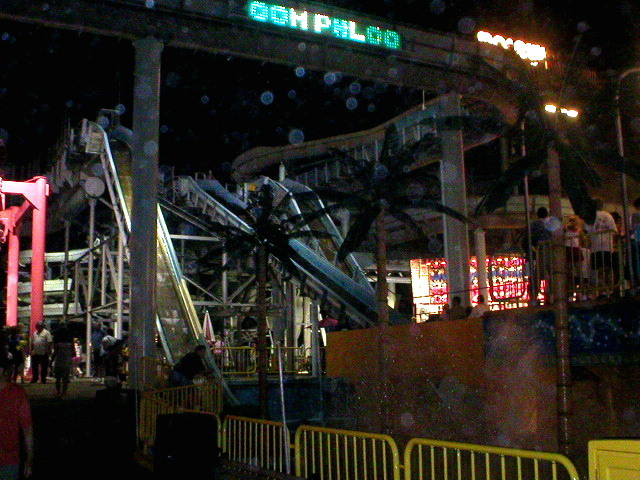 MY FAVORITE RIDE IN ALL OF WILDWOOD, GREAT DROPS, GREAT VIEW OF THE BOARDWALK, GREAT ALL AROUND RIDE.